If you were charged with a DUI in another state within the last ten years, your chances of having your recent California DUI charged only as a first conviction depend on the specific laws of the other state. In order for your first conviction to count as a prior in the state of California, the state that first arrested you must classify a DUI with all the same elements as a California DUI. For example, you can only be convicted of a DUI in California if you were operating your vehicle. In other words, you have to have actually been driving your car. In some states, however, you need only to be in control of your vehicle, meaning your car doesn’t even have to be running. You just have to be inside the vehicle and have possession of the keys required to operate it. Differences like these could save you from the more severe consequences of a second conviction. If you think the California DMV may be wrongfully charging your first conviction as a prior, contact a lawyer to evaluate your unique situation. You may be able to challenge this charge by filing a Writ of Mandamus–a move that could spare you the major headache of a second conviction. Let the skilled attorneys at Netzah & Shem-Tov take a look at your case and help you determine your best options. Even if a second conviction cannot be avoided, we will fight tirelessly to ensure your judgment is as light as possible. Generally, a covenant not to compete (“CNC”) is a provision in a contract which prohibits the parties to the contract from competing with each other if and when the contract terminates. Normally, this is seen in contracts between an employer and an employee where the employer provides the employ with special training and knowledge during the term of the employment, but wants to make sure the employee does not later leave the employer and opens up his own business which would be in competition with the employer. Similarly, the dissolution of an LLC or the termination of membership of a member of the LLC where the business of the LLC continues operating (B&P §16602.5). Many contracts in California contain CNC’s, either because the parties (or their attorneys) are unaware of these provisions in the Business and Professions Code, or because they believe that the party on the other side will not know these provisions and will abide by the CNC fearing a lawsuit. Whether you are a business hiring personnel, or a potential employee, you know your rights. Do not sign any contract or agreement until you have it reviewed by an experienced business attorney. Better yet, have the attorney draft the agreement, as there are many pitfalls in negotiating such contracts. Netzah & Shem-Tov, Inc. has the experience and know how to represent you in these and other complex business and corporate matters. It is far less costly to do things right the first time than to fix them later through litigation. As discussed in a previous post, the automatic stay prevents creditors from pursuing a debtor for payment or from foreclosing on a debtor’s property. However, the automatic stay is not fool proof. Creditors may file a motion with the bankruptcy court for relief from the automatic stay. If the motion is granted, the stay will not longer apply to that particular creditor and as such the creditor may resume collection efforts against the debtor, including foreclosure. In a Chapter 11 case, if the debtor’s only asset is a single piece of real property, there are special rules which apply. This type of Chapter 11 case is termed a “Single Asset Real Estate” case. One of the special rules in these types of cases is that, within 90 days of the filing of the case, the debtor must either propose a Plan of reorganization (that is, propose how it will handle its debts) or begin paying its secured creditors at least the interest owed to them. If the debtor fails to do so within the 90 days, the secured creditor (the mortgage company, for example) has a right to relief from stay. These rules are provided in 11 USC §362(d)(3). As you can see, Chapter 11 cases are complex. It is therefore extremely important for a debtor to have experienced Chapter 11 counsel. An attorney that only handles Chapter 7 and Chapter 13 cases will likely not know these, and other special rules which apply to Chapter 11 cases. An oversight of §362(d)(3) by an inexperienced attorney can be very costly to a debtor trying to reorganize his debts. When a debtor files any type of bankruptcy, a “automatic stay” is created which prevents all creditors from pursuing the debtor. That is, creditors cannot call or otherwise contact the debtor to ask for payment, they cannot sue the debtor (and any pending lawsuits are immediately halted), they cannot collect on a judgment and they cannot foreclose on any property of the debtor. As the description implies, this “stay” of the creditors is automatic. The filing of the bankruptcy case alone, and nothing else, creates the stay. So, even if a creditor does not know of the bankruptcy filing, any action the creditor takes against a debtor can be cancelled. For example, let us assume that there is a lawsuit pending against a debtor who has not yet filed for bankruptcy. The debtor decides not to file an Answer in the lawsuit and therefore the creditor requests that a default be entered against the debtor. Before the default is entered, however, the debtor files for bankruptcy. The next day, before the debtor has a chance to inform either the creditor or the court in which the lawsuit is pending of the bankruptcy filing, the court enters the default against the debtor. Sometime later, for whatever reason, the bankruptcy gets dismissed and the debtor now wants to file an Answer in the lawsuit. Normally, once a default is entered, the debtor (or defendant) can no longer file an Answer. However, in this case, since the bankruptcy was filed prior to the default being entered, the automatic stay prevented the default from being effective. Although neither the court nor the creditor knew of the bankruptcy, the default must be set aside. Some time ago, our office represented a client in this exact situation. We filed a motion to set aside the default entered against our client after the client had filed for bankruptcy. Although the creditor opposed our motion, the Judge recognized that due to the automatic stay being in effect on the date the default was entered, the default was ineffective. We won the motion, and our client was able to file his Answer and defend the lawsuit. 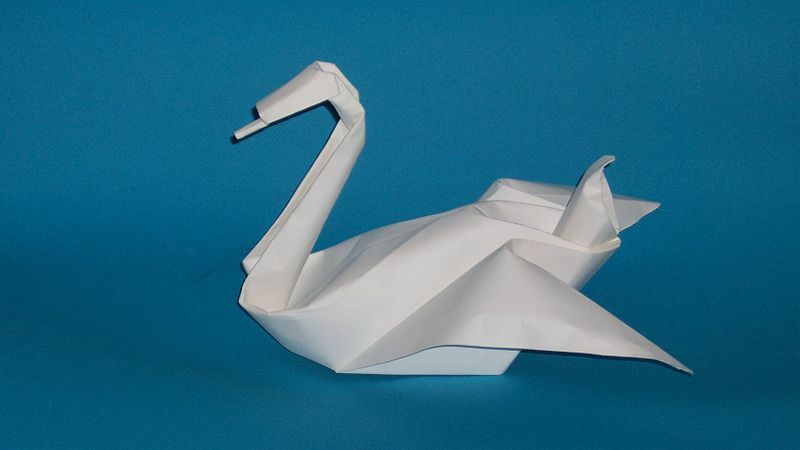 Swan by Akira Yoshizawa, the father of modern origami techniques. Origami, the art of folding paper into various three-dimensional shapes, has been around for centuries. It started in Japan sometime in the 17th Century, and has developed into a modern art form. Over the past several years the folding patters have gotten so complex that schematics, called crease patterns, are used as a blueprint for folding. Recently, one artist — Sarah Morris — has taken some crease patters created by Origami artists — such as Robert J. Lang — and has created her own art from these patterns. 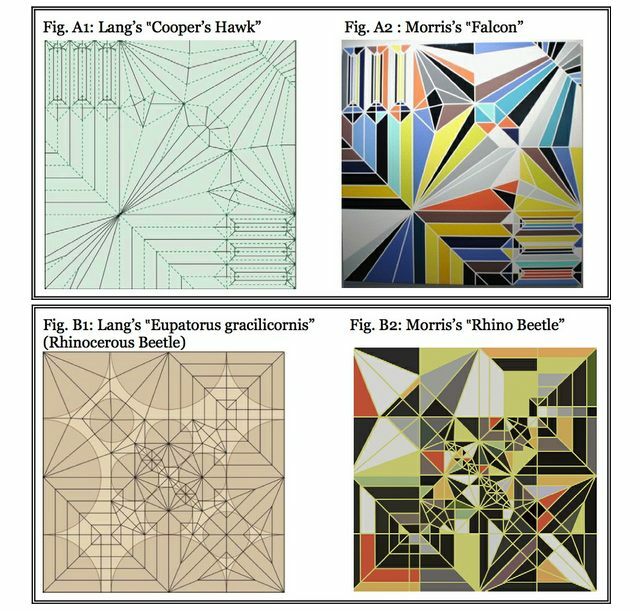 Lang, along with five other artists from Japan, Italy and Spain, have filed a copyright infringement lawsuit against Morris. Lang claims that the crease patterns are independent works of art protected by the Copyright Act, and thus any derivative works are also protected from copying. While the Copyright Act does protect derivative works (a work of art which is based upon a prior work), the question here is whether the crease patters are protected by copyright laws in the first place. If they are, Morris may have infringed on such rights. The list of categories which are protected by the Copyright Act are provided in 17 USC §102, and includes pictorial and graphic works (§102(a)(5)). It is important to note that copyright laws do not protect “any idea, procedure [or] process.” (§102(b)). So, are the crease patterns merely “procedures” for folding, or are they independent “pictorial or graphic works”? One way to look at it is to see whether other types of blueprints are protected by copyright. In fact, they are. Architectural works are specifically listed as a category of protected work (§102(a)(8)). However, these architectural works must be drawings or blueprints for the construction of a building. Whatever the definition of a “building” is, it certainly does not cover folded pieced of paper. Crease patterns on the left, Morris’s artwork on the right. It will be interesting to see how this case develops and, if it goes to trial, how the court will rule on the applicability of the copyright laws to these crease patterns. Can I Tell My Spouse Everything? Is It Safe To Speak With My Spouse? Can My Spouse Be Forced To Testify Against Me? Can I Prevent My Spouse From Testifying Against Me? The Marital Privilege, codified in CA Evidence Code §980, in its simplest form, prevents any person and/or entity from forcing one spouse to testify against the other spouse. This long standing privilege is based on the public policy that the institution of marriage is one of the cornerstones of a successful civil society. As a highly functioning civil society, so the theory goes, we want to create an environment conducive to strong, long lasting, trustworthy marriages. Granting a married couple the peace of mind that any communications conducted between the spouses will remain private, serves as the legal cornerstone for the idea that a strong marriage is based on trust and that spouses should be able to confide in one another yet rest assured that such communications will always remain private. Sounds like a simple enough concept right? But wait, before you run to your spouse and open that Pandora Box of secrets you have been keeping for the last 10 years, as is the case in most areas of the law, the devil is definitely in the details and the Marital Privilege is no exception to the rule. First and foremost, we need to separate between two different scenarios that are covered by the Marital Privilege. 1. Can one spouse be forced to testify against another spouse even if the testifying spouse does not wish to testify? The short answer is… in most situations, NO. However, in a handful of situations, YES. (keep reading for the detailed and complete answer). 2. In a situation where one spouse wants to testify against the other spouse, can the non-testifying spouse prevent the testifying spouse from testifying? The short answer is… depends on the situation (keep reading for the detailed and complete answer). The key element to understanding the Marital Privilege lies in the form of the communication that is at issue. If the communication is considered a CONFIDENTIAL COMMUNICATION, then no one can force one spouse to testify against the other spouse. Furthermore, if the communication is considered confidential, then one spouse can prevent the other spouse from testifying against him/her, even if the testifying spouse willingly wishes to testify against the non-testifying spouse. As such, the CONFIDENTIAL COMMUNICATION is absolutely the most protected form of communication between spouses and rarely can be revealed in a court of law, unless both spouses agree to the waiver of the privilege. 1. A husband and wife are lying in bed, the husband is visibly upset, the wife keeps asking her husband what is wrong, he keeps telling her that he can’t tell her… finally the husband turns to the wife and tell her that he just robbed a bank. This type of communication is clearly a confidential communication and even if the wife wanted to testify against her husband, her husband could prevent her from doing so. 2. Same situation but instead of being in their private bedroom, the couple is in a busy restaurant and the husband yells out to his wife “I just robbed a bank.” Clearly, there is no reasonable expectation to privacy in this situation and the communication would not be privileged. In this scenario, the husband could not prevent the wife from testifying, because the communication was not confidential, but the wife could choose not to testify because no one can force a spouse to testify against the other spouse if the content of such testimony would amount to ADVERSE SPOUSAL TESTIMONY, or stated differently: no one can force one spouse to testify against the other spouse if the testimony sought will be “bad” for the non-testifying spouse. The public policy behind this rule is that we do not want to force one spouse to testify adversely against the other spouse and at the conclusion of the testimony send the two home on their way to continue their strong and loving marriage. You can only imagine the horrible situation the wife in our scenario would be facing if at 10 a.m. she was forced to testify that her husband admitted to her that he robbed a bank and at 10 p.m. she would have to lay in the same bed with him to try to get a good night’s rest for the next day of her husband’s trial. Once again, public policy is to create an environment conducive to a strong and faithful marriage. Forcing one spouse to adversely testify against the other is clearly not conducive to a stable marriage environment. Some exceptions to this rule are cases of domestic violence where the entire privilege is essentially waived (the theory is that if the privilege applied, then one spouse would be able to not only beat the other spouse, but then prevent the victimized spouse from testifying in court relative to the beating). 1. The privilege against Adverse Spousal Testimony only belongs to the testifying spouse and that spouse can choose whether or not to testify. 2. The privilege against Confidential Marital Communications belongs to both spouses and as long as the communication in question is considered confidential, neither spouse can testify against the other, even if the testifying spouse wishes to testify against the other spouse. So tonight when you are lying next to your spouse one, feel free to tell them anything your little heart desires, knowing full well that your confessions are safely protected by our long standing Marital Privilege. But make sure that no one else can hear you, that you do not beat up your spouse while you utter your dirty little secrets and for G-d sakes make sure that the person lying next to you is indeed your legal spouse. If I get pulled over for a DUI, what if I initially refused, but later agreed to take the blood test? Can the DUI Prosecutor Elect to Drop the Refusal Enhancement? Yes. As part of plea negotiations, the prosecutor will often dismiss or “strike” the refusal enhancement. Many prosecutors hate to go to trial on refusal DUI cases because they don’t have a BAC test result to use against the defendant. So they are often willing to settle the cases on more favorable terms, depending on the state of the other the evidence. Can I Fight The Refusal Charge in My DUI Case? *Your DUI arrest was unlawful. The DUI and the refusal enhancement may be dismissed if there was not sufficient basis for the DUI officer to pull you over or arrest you. *You were not under the influence. In the event that a jury acquits you of the underlying DUI charge, the refusal enhancement no longer exists in the eyes of the court. Please note, this may not prevent the DMV from pursuing suspension of your drivers license. *You were not properly advised of the consequences of refusing. The DUI officer is required to advise you of the consequences of refusing the chemical test through a very specific set of warnings. (See Jury Instruction on Refusal) Neither the court nor the DMV can hold the refusal against you if the DUI officer failed to give you the warnings properly. *The DUI officer was unclear about the BAC test requirement. All warnings must be given in such a way that they’re comprehensible to the DUI suspect. As such, the refusal penalty may be negated in the event that the officer’s explanation caused confusion regarding the requirement to take the BAC test.